Artaxerxes II Mnemon /ˌɑːrtəˈzɜːrksiːz/ (Old Persian: 𐎠𐎼𐎫𐎧𐏁𐏂, meaning "whose reign is through truth") was the King of Kings (Xšâyathiya Xšâyathiyânâm) of Persia from 404 BC until his death in 358 BC. He was a son of Darius II and Parysatis. Greek authors gave him the epithet "Mnemon" (Greek: mnḗmona, in Old Persian: abiataka), meaning "remembering; having a good memory". Darius II died in 404 BC, just before the final victory of the Egyptian general, Amyrtaeus, over the Persians in Egypt. His successor was his eldest son Arsames who was crowned as Artaxerxes II in Pasargadae. Even before his coronation, Artaxerxes was facing threats to his rule from his younger brother, Cyrus the Younger. Four years earlier, Cyrus was appointed by his father as the supreme governor of the provinces of Asia Minor. There, he managed to pacify local rebellions and become a popular ruler among both the Iranians and Greeks. Towards the end of 405 BC, Cyrus became aware of his father's illness. By gathering support from the local Greeks and by hiring Greek mercenaries commanded by Clearchus, Cyrus started marching down towards Babylonia, initially declaring his intention to crush the rebellious armies in Syria. By the time of Darius II's death, Cyrus had already been successful in defeating the Syrians and Cilicians and was commanding a large army made up of his initial supporters plus those who had joined him in Phrygia and beyond. Upon hearing of his father's death, Cyrus the Younger declared his claim to the throne, based on the argument that he was born to Darius and Parysatis after Darius had ascended to the throne, while Artaxerxes was born prior to Darius II gaining the throne . Artaxerxes became involved in a war with Persia's erstwhile allies during the Peloponnesian war, the Spartans, who, under Agesilaus II, invaded Asia Minor in 396-395 BC. In order to redirect the Spartans' attention to Greek affairs, Artaxerxes subsidized their enemies through his envoy Timocrates of Rhodes: in particular the Athenians, Thebans and Corinthians received massives subsidies. 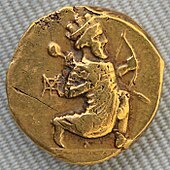 Tens of thousands of Darics, the main currency in Achaemenid coinage, were used to bribe the Greek states to start a war against Sparta. These subsidies helped to engage the Spartans in what would become known as the Corinthian War. According to Plutarch, Agesilaus said upon leaving Asia Minor "I have been driven out by 10,000 Persian archers", a reference to "Archers" (Toxotai) the Greek nickname for the Darics from their obverse design, because that much money had been paid to politicians in Athens and Thebes in order to start a war against Sparta. The King's Peace, promulgated by Artaxerxes II in 387 BC, put an end to the Corinthian War under the guarantee of the Achaemenid Empire. In 386 BC, Artaxerxes II betrayed his allies and came to an arrangement with Sparta, and in the Treaty of Antalcidas he forced his erstwhile allies to come to terms. This treaty restored control of the Greek cities of Ionia and Aeolis on the Anatolian coast to the Persians, while giving Sparta dominance on the Greek mainland. In 385 BC he campaigned against the Cadusians. Although successful against the Greeks, Artaxerxes had more trouble with the Egyptians, who had successfully revolted against him at the beginning of his reign. An attempt to reconquer Egypt in 373 BC under the command of Pharnabazus, satrap of Hellespontine Phrygia, was completely unsuccessful, but in his waning years the Persians did manage to defeat a joint Egyptian–Spartan effort to conquer Phoenicia. In 377 BC, Pharnabazus was reassigned by Artaxerxes II to help command a military expedition into rebellious Egypt, having proven his ability against the Spartans. Achaemenid campaign of Pharnabazus II against Egypt in 373 BC. After 4 years of preparations in the Levant, Pharnabazus gathered an expeditionary force had 200,000 Persian troops, 300 triremes, 200 galleys, and 12,000 Greeks under Iphicrates. The Achaemenid Empire had also been applying pressure on Athens to recall the Greek general Chabrias, who was in the service of the Egyptians, but in vain. The Egyptian ruler Nectanebo I was thus supported by Athenian General Chabrias and his mercenaries. 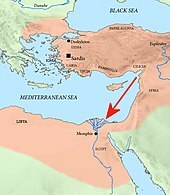 The Achaemenid force landed in Egypt with the Athenian general Iphicrates near Mendes in 373 BC. The expedition force was too slow, giving time to the Egyptians to strengthen defenses. Pharnabazus and Iphicrates appeared before Pelusium, but retired without attacking it, Nectanebo I, king of Egypt, having added to its former defences by laying the neighboring lands under water, and blocking up the navigable channels of the Nile by embankments. (Diodorus Siculus xv. 42; Cornelius Nepos, Iphicrates c. 5.) Fortifications on the Pelusiac branch of the Nile ordered by Nectanebo forced the enemy fleet to seek another way to sail up the Nile. Eventually the fleet managed to find its way up the less-defended Mendesian branch. At this point, the mutual distrust that had arisen between Iphicrates and Pharnabazus prevented the enemy from reaching Memphis. Then the annual Nile flood and the Egyptian defenders' resolve to defend their territory turned what had initially appeared as certain defeat for Nectanebo I and his troops into a complete victory. After several weeks the Persians, and their Greek mercenaries under Iphicrates, had to reembark. The expedition against Egypt had failed. It was the end of the career of Pharnabazus, who was now over 70 years old. Pharnabazes was replaced by Datames to lead a second expedition to Egypt, but he failed and then started the "Satraps' Revolt" against the Great King. The Achaemenid defeat in Egypt led to unrest among the Achaemenid nobility. From 372 BC many western satrapies of the Achaemenid Empire started to rebel against Artaxerxes II, in the Great Satraps' Revolt, starting with the powerful satrap Datames. Following the failure of Pharnabazus II in Egypt, Datames had been entrusted by the Persian king with the chief command of a force designed for the recovery of Egypt. But the machinations of his enemies at the Persian court, and the risks to which he was in consequence exposed, induced him to change his plan, and throw off his allegiance to the king. He withdrew with the troops under his command into Cappadocia, and made common cause with the other satraps who were revolting from Persia. The Pharaoh Nectanebo provided financial support to the rebelling satraps and re-established ties with both Sparta and Athens. Artaxerxes II finally quashed the Revolt of the Satraps by 362 BC. Artaxerxes again attempted to mediate in conflicts between the Greek city-states at the time of the Theban hegemony, especially the Theban–Spartan War. He sent Philiscus of Abydos, a hyparch ('vice-regents') and military commander of the Achaemenid satrap Ariobarzanes, to Delphi in order to help the Greek negotiate peace. The objective of Philicus of Abydos was such to help broker a Common Peace between the Greek belligerants reunited at Delphi. The negotiation collapsed when Thebes refused to return Messenia to the Spartans. Before returning to Abydos, Philicus used Achaemenid funds to finance an army for the Spartans, suggesting that he was acting in support of the Spartans from the beginning. With the Achaemenid financing of a new army, Sparta was able to continue the war. Among the mercenaries whom he had recruited, Philiscus gave 2,000 to the Spartans. He also probably provided funds to the Athenians and promised them, on behalf of the King, to help them recover the Chersonese militarily. Both Philiscus and Ariobarzanes were made citizens of Athens, a remarkable honor suggesting important services rendered to the city-state. During autumn of 367 BCE, first the Spartans, soon followed by the Athenians, the Arcadians, the Argives, the Eleans, the Thebans and other Greek city-states sent envoys to Susa in attempts to obtain the support of Achaemenid king Artaxerxes II in the Greek conflict. The Achaemenid king proposed a new peace treaty, this time highly tilted in favour of Thebes, which required Messenia to remain independent and that the Athenian fleet to be dismantled. This Peace proposal was rejected by most Greek parties except Thebes. Sparta and Athens, dissatified with the Persian king's support of Thebes, decided to provide careful military support to the opponents of the Achaemenid king. Athens and Sparta provided support for the revolted satraps, in particular Ariobarzanes: Sparta sent a force to Ariobarzanes under an aging Agesilaus II, while Athens sent a force under Timotheus, which was however diverted when it became obvious that Ariobarzanes had entered frontal conflict with the Achaemenid king. An Athenian mercenary force under Chabrias was also sent to the Egyptian Pharao Tachos, who was also fighting against the Achaemenid king. Ethnicities of the soldiers of the Empire, on the tomb of Artaxerxes II. On the lintel over each figure appears a trilingual inscription describing each ethnicity. These are known collectively as "Inscription A2Pa". The tomb of Artaxerxes II is located at Persepolis, and was built on the model of his predecessors at Naqsh-e Rustam. On the upper register of the tomb appear reliefs of the Emperor, supported by the soldiers of all ethnicities of the Empire. On the lintel over each figure appears a trilingual inscription describing each ethnicity. These are known collectively as "Inscription A2Pa". Tomb of Artaxerxes II in Persepolis. Upper Relief of the tomb of Artaxerxes II. The Jewish high priest Johanan is mentioned in the Elephantine papyri dated to 407 BC, i.e., during Darius II's reign, and is also mentioned in Ezra 10:6 after the reign of Darius (Ezra 6:1) and during the rule of Artaxerxes (Ezra 7:1), thereby supporting the chronological sequence. Amongst others, it has been suggested that Artaxerxes II was the Ahasuerus mentioned in the Book of Esther. Plutarch in his Lives (AD 75) records alternative names Oarses and Arsicas for Artaxerxes II Mnemon given by Deinon (c. 360–340 BC) and Ctesias (Artexerxes II's physician) respectively. These derive from the Persian name Khshayarsha as do "Ahasuerus" ("(Arta)Xerxes") and the hypocoristicon "Arshu" for Artaxerxes II found on a contemporary inscription (LBAT 162). These sources thus arguably identify Ahasuerus as Artaxerxes II in light of the names used in the Hebrew and Greek sources and accords with the contextual information from Pseudo-Hecataeus and Berossus as well as agreeing with Al-Tabari and Masudi's placement of events. The 13th century Syriac historian Bar-Hebraeus in his Chronography, also identifies Ahasuerus as Artaxerxes II citing the sixth century AD historian John of Ephesus. Artaxerxes II is reported to have had a number of wives. His main wife was Stateira, until she was poisoned by Artaxerxes' mother Parysatis in about 400 BC. Another chief wife was a Greek woman of Phocaea named Aspasia (not the same as the concubine of Pericles). Artaxerxes II is said to have more than 115 sons from 350 wives. ^ R. Schmitt. "ARTAXERXES". Encyclopædia Iranica. 15 December 1986. Retrieved 12 March 2012. ^ electricpulp.com. "ARTAXERXES II – Encyclopaedia Iranica". www.iranicaonline.org. Retrieved 4 February 2018. ^ "The Achaemenid Empire". Retrieved 2015-06-21. ^ a b Snodgrass, Mary Ellen (2015). Coins and Currency: An Historical Encyclopedia. McFarland. p. 125. ISBN 9781476611204. ^ "Persian coins were stamped with the figure of an archer, and Agesilaus said, as he was breaking camp, that the King was driving him out of Asia with ten thousand "archers"; for so much money had been sent to Athens and Thebes and distributed among the popular leaders there, and as a consequence those people made war upon the Spartans" Plutarch 15-1-6 in Delphi Complete Works of Plutarch (Illustrated). Delphi Classics. 2013. pp. 1031, Plutarch 15-1-6. ISBN 9781909496620. ^ Schwartzwald, Jack L. (2014). The Ancient Near East, Greece and Rome: A Brief History. McFarland. p. 73. ISBN 9781476613079. ^ Ruzicka, Stephen (2012). Trouble in the West: Egypt and the Persian Empire, 525-332 BC. New York, NY: Oxford University Press. pp. 55–62. ISBN 978-0-19-976662-8. ^ Gershevitch, I.; Fisher, William Bayne; Boyle, John Andrew; Yarshater, Ehsan; Frye, Richard Nelson (1985). The Cambridge History of Iran. Cambridge University Press. p. 372. ISBN 9780521200912. ^ Ruzicka, Stephen (2012). Trouble in the West: Egypt and the Persian Empire, 525-332 BC. Oxford University Press. p. 99–105. ISBN 9780199908776. ^ a b Gershevitch, I.; Fisher, William Bayne; Boyle, John Andrew; Yarshater, Ehsan; Frye, Richard Nelson (1985). The Cambridge History of Iran. Cambridge University Press. p. 373. ISBN 9780521200912. ^ a b Gershevitch, I.; Fisher, William Bayne; Boyle, John Andrew; Yarshater, Ehsan; Frye, Richard Nelson (1985). The Cambridge History of Iran. Cambridge University Press. p. 374. ISBN 9780521200912. ^ Heskel, Julia (1997). The North Aegean Wars, 371-360 B.C. Franz Steiner Verlag. p. 113. ISBN 9783515069175. ^ a b Heskel, Julia (1997). The North Aegean Wars, 371-360 B.C. Franz Steiner Verlag. p. 96. ISBN 9783515069175. ^ a b c d e Fine, John Van Antwerp (1983). The Ancient Greeks: A Critical History. Harvard University Press. p. 584. ISBN 9780674033146. ^ a b c d Souza, Philip de; France, John (2008). War and Peace in Ancient and Medieval History. Cambridge University Press. p. 41. ISBN 9781139469487. ^ a b Heskel, Julia (1997). The North Aegean Wars, 371-360 B.C. Franz Steiner Verlag. p. 113. ISBN 9783515069175. ^ Fine, John Van Antwerp (1983). The Ancient Greeks: A Critical History. Harvard University Press. p. 585. ISBN 9780674033146. ^ "Achaemenid Royal Inscriptions: A2Sa". www.livius.org. Retrieved 2015-06-21. ^ Bezalel Porten (Author), J. J. Farber (Author), C. J. F. Martin (Author), G. Vittmann (Author), The Elephantine Papyri in English (Documenta Et Monumenta Orientis Antiqui, book 22), Koninklijke Brill NV, The Netherlands, 1996, ISBN 9781589836280, p 125-153.